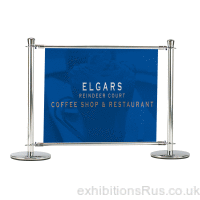 Cafe barrier system, chrome posts with connecting poles and banners for use in cafe, restaurant and Public bar areas and exhibition venues to cordon off an area or zone or control crowds and public groups. The chrome posts are 1.1M high and the poles are connected with trigger hooks. Banners and cross rails are offered in standard sizes but can be made to suite any size as required. 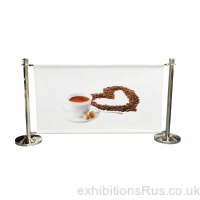 We carry stocks of our cafe barrier range, but expect a week for supply with printed banners depended on our work load. call for better timelines 01256 768178.